We’ve lost over half the number of Cuckoos in the UK over the last 20 years. 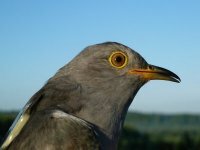 Since 2011 we’ve been satellite-tracking Cuckoos to find out why. We’ve learned lots of vital information which could help us to understand our Cuckoos - such as how the different routes taken are linked to declines, and some of the pressures they face whilst on migration. But there is still more to discover. We now need to look more closely at how dependent they are on, and how much their migration is linked, to the drought-busting rains of the weather frontal system known as the Inter Tropical Convergence Zone (ITCZ) as they move out of the Congo rainforest and begin to head back to the UK via West Africa. This project wouldn't have been possible without the amazing support from funders and sponsors. Read more about the project and find out how you can get involved. We have been able to share our expertise around tracking Cuckoos with other international studies, such as the Beijing Cuckoo Project. Follow our Cuckoos as they move to and from Africa.